Finish off your signature burger or fried fish sandwich with this Choice 12 oz. clear wide mouth squeeze bottle. This bottle's versatile, simple design is ideal for both back-of-house and front-of-house applications. While its open tip eliminates the need to cut off the top, its tight, no-leak cap prevents accidental spills and messes. Thanks to its innovative, wide mouth design, it's also easy to refill and clean after busy shifts at your restaurant, cafe, concession stand, or cafeteria. I bought these for my cafe. I use them for mayo & mustard. They hold just enough ingredients for one days needs. They are easy to clean & the price was great! Very sturdy and overall great product easy to fill with sauces. Easy to clean and sanitize. And the product comes out of these squeeze bottles great. Sturdy plastic bottle, but easy to squeeze. The wide mouth makes for easy filling. For thicker sauces, we needed to cut the tip a bit, for easier flow, but otherwise, these are totally suited to our needs. We bought three different sizes! Great for use in our small deli. We send these out with party trays and they are so inexpensive that we don’t care if they don’t get returned. I love my Choice squeeze bottles. We use them in our sweet shop for the liquid flavorings and sauces. The wide mouth makes them easy to refill and easy to keep clean. We will definitely be ordering these again. Great squeeze bottle for the price. We have had issues with other brands and the lids not fitting snug. These are great, would buy again. Perfect size squeeze bottle for syrups and sauce. These are a great value for the price. We make syrups from scratch in small batches before offering them to our customers, and using 12 oz. squeeze bottles help reduce waste. The size bottle is perfect for restaurants to keep their salad dressings in. The convenient squeeze pour top is wonderful when you’re looking to be more intricate for presentation then just served with a ladle. This product was everything I expected it to be. Liked them so much I got some for my home use. Great product for the price! These leak pretty heavily with less viscous liquids. I use these for olive oil and vinegar and it's pretty difficult to manage even distribution since they leak out of the closure when turned upside down. Thank you for your review, shawn! We are sorry this Choice 12 oz. Clear Wide Mouth Squeeze Bottle - 6/Pack has not worked well for you. A Customer Solutions Representative will contact you soon! Bottles ended up being too small for our use but bottle itself is durable and lasting over a year so far of constant use. Washing constantly with hot water. Walls feel thined out over time but still great. They do the trick - I wouldn't recommend holding any hot liquids or sauces in them as they will become really soft when heated - but that's to be expected - they are plastic after all. These are the best bottles at the absolute best price. I use them for sour cream, mayo, ketchup, mustard, BBQ sauce, etc. I LOVE the wide mouth too! Perfect, affordable and a MUST HAVE if you run a catering business. Very easy to fill up because of the wide mouth and very resistant. Lid closes tightly which is always a concern with similar products. The best part? I can leave them with the clients because the cost is minimum which also means no washing. These wide mouth squeeze bottles are great for things such as salad dressings, aioli, barbecue sauce, etc. They are inexpensive, easy to fill and clean. There are perfect for what we use them for. We use them at our coffee shop to put the remaining sauces from the bottle of their bottles and turn it into a sauce squeeze bottle for the tops of the drinks. Great squeeze bottle and works well for those sauces that aren't used as frequently. The smaller size also has less weight pushing the liquid out when upside down and allows more control. Love the wide mouth squeeze bottles. We use them for our tamarind sauce, pepper sauce and cilantro sauce. Easy to clean and easy to use. These bottles are ideal for restaurants. They’re easy to clean, easy to fill, and durable as heck. The plastic is thick enough to be durable yet give a comfortable squeeze. The tips can always be trimmed down for a larger line. Great price for these standard 12 oz squeeze bottles. We go through them frequently, great to find an affordable price for these so we don't have to worry about changing them. I used this for salsas. They easily clean up, the plastic doesn't stain with red salsa, unlike other bibs I would love to see how they withstand age. Bottles are great. If you need caps to go on the nozzles, you will have to go with a different brand. These are not cap friendly. These nozzles are very thick walled, so the caps barely fit on them, and these nozzles don’t have a ridge to hold the cap on either. Otherwise, they seem well made. The squeeze bottles are great quality they have lasted us for a really long time and are super cheap to replace they ship out really quickly and the cabs are cheap to buy to cover them. This bottle has been great for my employees and has helped keep the kitchen very clean. I look forward to buying this bottle again. Thanks! 12 oz squeeze bottles are great for salad dressings, sauce drizzles and cookie decorating. The bottle is good for storage in the refrigerator and fairly easy to clean up. This ones works really great i love it!!! perfect for salad dressings or ketchup mustard or anything you want to squeeze, roks perfect ant don't open!! get it!! These cost effective squeeze bottles are convenient for all types of sauces. They work perfectly for thick BBQ Sauces as well as other condiments. The wide mouth makes it easy to fill without creating a mess. Caps are available for these which makes them even more convenient to use and safely store. You can also snip off a little bit of the tip for sauces with large pieces of spice so it doesn't clog. Great value for the money. I use these for ketchup, mustard and other condiments. They work great and have lots of different uses in the kitchen. The price is good too. I wanted a squeeze bottle with a large capacity and sizable top hole. I use thick sugary syrups for fancy esspresso dessert coffees. They work perfectly. Very good squeeze bottles. The clear color makes them ideal for sauces, oils, and water. The wide mouth makes it easy to pour liquids in. These 12 oz squeeze bottles are must in the kitchen. They are great for all kinds of sauces . They are made well and will last a long time . These bottles are great for any type of sauce. The wide mouth makes filing them so quick and easy. They are durable, being clear makes it easy to see what is inside, and they hold up well. Being able to get caps for them makes them even more convenient and a great value. I find mysef going through squeeze bottles like crazy. the price point is great on these. I usually have to cut the tip to make it a little wider depending on what im squeezing. These squeeze bottles are super. We used them for all our sauces and oils in the kitchen, and for ketchup and mustard in the dining room. They are made of a nice polymer plastic that springs right back instead of denting. The only downside is staining, but that’s pretty much a nonissue. This product is very well put together and serves it purpose well. We use these for storing all of our sauces and it has minimal clogs. Would not look elsewhere for a solution for this. This is an all purpose squeeze bottle for any type of sauce. The caps seals tight and goes around the entire mouth of the bottle to reduce chance of spillage. This 12 oz Clear Wide Mouth Squeeze Bottle is perfect for our mayonnaise and mustard. We used the regular mouth ones and it was a hassle to get the mayo in, these are wide and so easy to refill. The 12 oz clear wide mouth squeeze bottle is very cost effective. With the wide mouth, it allows you to easily fill your product with less spills. These were exactly what I was looking for. I used these for dressings and they served their purpose well. They were also easy to clean and didn't stain. a must have for restaurants of any type! great for squeezing on sauces and you can cut the tip of the opening to your liking! Perfect circumference and size of a bottle to hold in your hand and use comfortably. I use this to organize condiments in my fridge and make it easy to use dressings and such. Spring for the wide mouth bottles any time you can. Makes refilling so much easier. These squeeze bottles are great for condiments and even some sauces and don't take up much space. I have used these squeeze bottles for salad dressings and salsas. They work well every time. The price is great and the quality is good too. Works well and just as expected. I just wish that tips for the bottles were included, so that the bottles could be sealed to prevent refrigerator odors from spoiling the contents. These are Very nice durable squeeze bottles. I used this to drizzle the chocolate ganache sauce on some cupcakes. Super easy to use and clean! Our kitchen prefers the wide mouth squeeze bottles because they are much easier to refill. Keep extras stocked in your fridge for easy replacing when out. Perfect! I use these for creating honey straws. I love that if I don't use all of the product, there are end caps to seal the bottle (sold separately). I warm these in a double boiler to make the honey easier to squeeze out and they stand up very well. A very durable squeeze bottle. The 12 oz wide mouth squeeze bottles are affordable, durable and very easy to clean. Our restaurant uses them for various kinds of oils...vegetable, coconut, olive etc. Our kitchen staff loves them because they're easy to use. These are easy to squeeze and to quickly drizzle sauces and syrups over deserts. We just use cling wrap over the nozzle to seal it and tape sticks easily to the sides for quick labels to describe contents and note dates. 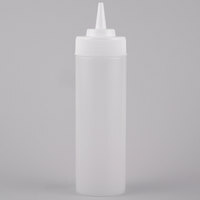 This Squeeze bottle is a great alternative to store and dispense sauces and dressings, our customers use it for food service in the kitchen as well as for tabletops. Great item at a great Price. We use these bottles to send along with party trays at our deli. One filled with mayo and one with oil and vinegar. Cheap enough that if a customer doesn't return it, it's not a loss for us. We mostly use the larger sizes of these at our bar, but we use these for little one-off syrups we make for daily specials, perfect size. Very nice and very strong squeeze bottles. They hold up in the cooler and in the hot water bath in the steam table they work well. These squeeze bottles are so great! They are much easier to refill due to the wide mouth. Perfect for all of our sandwich condiments and dressings! This Clear Wide Mouth Squeeze Bottle is a perfect solution for any use. The bottle is clear and the queeze is without cone. you can also write in the bottle. A lightweight squeeze bottle. Not sure if I would use for ketchup and mustard on a hot dog stand, but oil and water for the flat top? Awesome and great price. Easy wide mouth to fill and good size top for precision drizzling. Pretty durable and a good size. Great for using to draw pictures. The holes get plug up pretty easy so keep'em clean. Love these. They are so cheap they are almost disposable. The tip can be cut to any size opening and we use them all over the place. Never, ever buy narrow mouth bottles! Some bottles on the market are cheap and don't last very long. These 12 oz. bottles are strong and much cheaper than anywhere else we've found. Great bottle to use for dressing plates with a design. Had made things a lot easier in the kitchen and is easy to keep clean. Dishwasher safe so you wont have to worry about putting it in a machine. Simple, and inexpensive squeeze bottle. We use these for garnishing w/ olive oil or truffle oil. Tip can be cut to allow for thicker sauces. Bought these especially for the wide mouth - ease of filling. I use for a variety of liquids. To store, I just put a piece of plastic wrap over top of the bottle and screw the lid back on. They have held up really well. The wide mouth squeeze bottles are the way to go. Very easy to fill. These are very good quality. I have bought dozens of these. Holds syrup for our breakfast restaurant and works as it is suppose to. After awhile they loose their integrity - after much use and they will need to be replaced - but inexpensive enough that we do just that when needed. PERFECT! We buy our Ranch Dressing and Frank's Red Hot in bulk, these squeeze bottles are easy to fill (with a funnel) and squeeze out easy. The plastic took to the die in Frank's Red Hot fairly quickly, but so long as we continue to use the same container for the same product, it's not at all problematic. Item was satisfactory. It says it was clear but actually came with a white lid. So the bottle is clear but the lid is white. Kind of looks funny. these bottles are great for serving up sauces, or other condiments... OR... for adding liquid ingredients to foods in the kitchen. I only wish they came with caps. great for toppings such as chocolate or caramel sauce, but also good for smaller items such as sprinkles or even nerds (we just cut the tops off if we want/need the opening larger). These are on the small size but for things that are only used in small quantities they are not bad. Easy to clean because of the wide mouth. We love these squeeze bottles for condiments and sauces. They are also great for dispensing smaller amounts of oils and cooking sauces by the stove. The wide mouth makes them easy to fill and easy to clean. Great squeeze bottles for hot or cold sauces!!! Great value pack/ price!! Wide mouth top makes filling the bottles a breeze, you just have to turn them over and pour your dressing, etc. right in them! I use these to melt chocolate pieces (available in this store in all colors) in order to make chocolates in molds. The plastic holds up to microwaving to melt the chocolate. The wide mouth on these is really what makes them great. SO easy to load up with sauces or condiments...no funnel needed. I've had to cut down the spout a couple of times for various sauces that are a bit thicker, but overall these are great. This is the best bottle for any type of sauce or condiments.These bottle are a breeze to clean because of the wide mouth opening. This is the only bottle to use for easy cleaning. Wonderful product. We use these bottles for every imaginable application. Finishing sauces, water for steaming, and dressing salads just to name a few. The most used product in our kitchen. I absolutely love these wide mouth squeeze bottles! I have been struggling with the regular kind for so long, it's like a dream come true to be able to clean these instead of throwing them out (like I did with the regular ones).